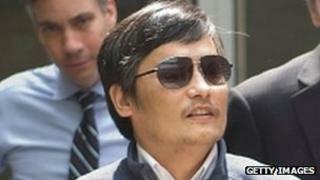 The US says it expects China to allow prominent dissident Chen Guangcheng to travel abroad soon. The US state department said Mr Chen had been offered a fellowship at an American university, and it would allow his wife and children to accompany him. Earlier, Beijing said the blind activist could apply to study abroad - paving the way for a resolution to a tense diplomatic stand-off with the US. Mr Chen fled house arrest last month and spent six days in the US embassy. He left but now says he wants to go to the US with his family. His case has overshadowed high-level US-China talks taking place in Beijing. US State Department spokeswoman Victoria Nuland said in a statement that Mr Chen had been offered a fellowship from an American university - later identified as New York University (NYU). She said Mr Chen could be accompanied by his wife and children, and that the US expected Beijing to process their application for travel "expeditiously". "The United States government would then give visa requests for him and his immediate family priority attention," the statement added. Jerome Cohen, an NYU law professor who arranged the fellowship, was quoted as saying by the Associated Press news agency: "It's a good way out for the Chinese government and our government and for Chen and his family." Earlier, Xinhua news agency quoted foreign ministry spokesman Liu Weimin as saying: "If he wishes to study overseas, as a Chinese citizen, he can, like any other Chinese citizens, process relevant procedures with relevant departments through normal channels in accordance with the law." Following an annual strategic dialogue between the US and China, Secretary of State Hillary Clinton said she was "encouraged" by the Chinese statement. "Progress has been made to help him have the future he wants," she told a news conference in Beijing. Mrs Clinton also confirmed that the US ambassador in Beijing had spoken to Mr Chen by phone on Friday, and that an embassy doctor had been able to visit him. The dissident is currently in a Beijing hospital, sealed off by Chinese police. Mr Chen spent a week in the US embassy after escaping from house arrest for more than a year-and-a-half. He left the embassy on Wednesday after accepting China's assurances of his safety. Media captionClinton: "This is... about the human rights and aspirations of a billion people." He later said that in view of the threats against his family, he had decided to leave the country. He told the Associated Press news agency that his wife was being followed and filmed by unidentified men whenever she was allowed to leave the hospital. China had earlier demanded an apology from the US for sheltering Mr Chen in its embassy. One of China's main official newspapers, the Beijing Daily, accused the dissident of being "a tool and a pawn for American politicians to blacken China". In another development, the Chinese authorities have told some foreign correspondents covering the Chen story they may lose their visas if they breach regulations again. The police warning came after the journalists, thought to number about 20, were accused of entering the hospital where Mr Chen is being treated without permission. Mr Chen, 40, is a lawyer who has campaigned against forced abortions and sterilisations of women under China's policy of one child per family. The case has increasing political resonance in the US. Republican presidential hopeful Mitt Romney has said that if reports that Mr Chen had been persuaded to leave the embassy were true, it was "a day of shame for the Obama administration".